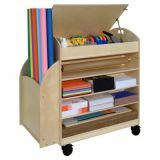 The Wood Designs Maker's Cart helps create an incredible crafting experience for you and your children. This all-in-one station provides the safety and durability you expect for your home or classroom. 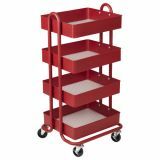 This easy to organize cart is ready to store all your arts and craft supplies with a variety of storage compartments. Keep any sharp or other permanent supplies away from children's reach with our large locking teacher's section at the top of the cart. The lid is equipped with a heavy duty locking arm hinge that lowers the lid slowly and gently keeping fingers safe. Put all the craft paper you need with our center ¾” inch dowel, supporting up to 35” W inches worth of paper. Additionally store and secure all your colorful paper in our side nook measuring 21” deep. 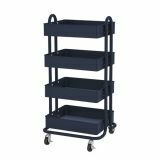 Move this heavy duty cart comfortably with our reliable locking casters and conveniently placed hand cutouts. Constructed from 100% Baltic Birch plywood with eased edges and coated with our exclusive Tuff-Gloss UV Finish making it resistant to stains and durable for any childhood settings. 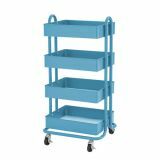 The unit's full Dimensions are: 45 ¾” H x 44” W x 24 ¼” D (including casters). 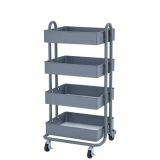 The lower shelves range from 1 5/8” - 7” H x 17 ¼” - 35” W x 9” – 24 ¼” D. The Maker's Cart is fully assembled on casters and comes with our Lifetime warranty. Additionally the Maker's Cart comes with 20 23" x 25" Cardboard sheets to get you started!